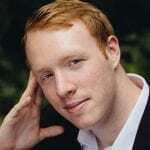 Oliver Johnston makes his role debut this week as Narraboth in performances of Strauss’ Salome with Opera North. We caught up with him in between rehearsals to find out how things are going. Tell us about the role of Narraboth. I’m really enjoying singing the role of Narraboth. It’s a great role for a young tenor. Although you’re only on stage for the first 35 minutes of the opera, you get to explore a huge range of emotions in this short time. Narraboth is a young captain of the guard who is completely infatuated with Salome. Salome manipulates Narraboth to get closer to Jochanaan. Once Narraboth sees how Salome looks at the Prophet, he can’t contain his grief and kills himself in front of everyone. You begin the opera with some delicate and touching moments and gradually things become very desperate culminating in the suicide. The most tragic thing is Salome doesn’t even notice that Narraboth has killed himself and it makes no difference to her. I also found it interesting exploring the relationship between the Page and Narraboth in our production. Strauss leaves little clues along the way that suggest that Narraboth and the Page might be in a relationship. Strauss’ music and libretto are so detailed, leaving signposts like the green flower which Salome offers Narraboth as a wink to Oscar Wilde’s famous green carnation. This makes Narraboth’s suicide even more gut wrenching as the Page is left alone and Narraboth never recognises the person that cared for him most. Are you enjoying the role and opera so far? Tell us about the production / staging. It’s been great to do a semi-staged version of the opera as I think it’s allowed us to delve deeper into the characters as we don’t have scenery, costumes, or severed head on a platter (!!) etc. to fall back on. It’s also been great having the orchestra on stage with us as opposed to buried in the pit. It feels like a huge ensemble piece where everyone has to be connected and really listen to each other. Strauss’ operas are also orchestrally more like tone poems with voices written above, therefore you get the full impact of the orchestral sound this way plus the exquisite dance of the seven veils! The orchestra of Opera North are absolutely phenomenal, and you don’t have to worry about being drowned as they are so sensitive to the singers and very supportive musicians. It’s also been a real masterclass for me to be surrounded by such amazing and experienced colleagues in this production and I’ve learned a huge amount from all of them. It’s been great to draw from the huge experience of conductor Sir Richard Armstrong who has been extremely supportive and the youthful energy and amazing ideas of director PJ Harris. Just standing next to the principals has been an unbelievable experience. What’s it like being back with Opera North? It’s fantastic to be back at Opera North. It’s an amazing company doing some unbelievable things. The overwhelming feeling you get as soon as you step back on the stage there is that everyone is so happy and this feeds into the productions. The principals they attract are amazing but the strength in the chorus is very special. Everyone in the chorus is a principal in their own right and this allows the company to cast a lot from the chorus. It all contributes to a very happy family feeling. I very much feel at home here and hope I can come back very soon. Next I will be heading to Garsington to sing Fenton in Falstaff. Again, this is a company who really nurtures and looks after its young singers and they have indeed looked after me from a chorus member through to covers and small roles and I can’t wait to return. Particularly with this production directed by Bruno Ravella, who was inspiring in Intermezzo a few years ago. I can’t wait to see what he has planned! For more information and tickets, see the Opera North website.